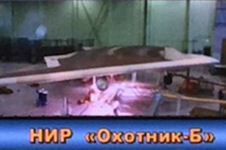 The OKB Sukhoi's Hunter-B [Okhotnik-B], the first Russian heavy drone, entered the final stage of ground tests. This was reported to Interfax 28 June 2018 by an informed source. 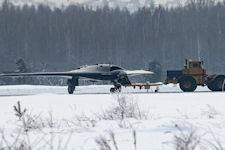 "At the Novosibirsk Aviation Plant (NAZ, a branch of the Sukhoi-IF company), the first roll-out of the drone UHT manned was held - it passes ground tests on the eve of the first flight," the source said. "The first flight of the "Hunter" is expected in 2019," - said the source. About the ongoing research in the OKB "Sukhoi" research on the creation of heavy drone in 2014, said the director of the Directorate of Military Aircraft Programs of the United Aircraft Corporation (UAC), ex-commander of the Russian Air Force Vladimir Mikhailov. "Now the work is underway, we are doing work on the Sukhoi Hunter. This machine is very promising, now there is a research work to 2015, with the subsequent transition to experimental design work," Mikhailov said on the radio station "Echo of Moscow". The characteristics of the developed UAV were not disclosed. According to open data, its take-off weight will be 20 tons, which will make it the heaviest of the developed devices of this type. It was reported that for the first time it will take off in 2018, and in 2020 will be adopted. 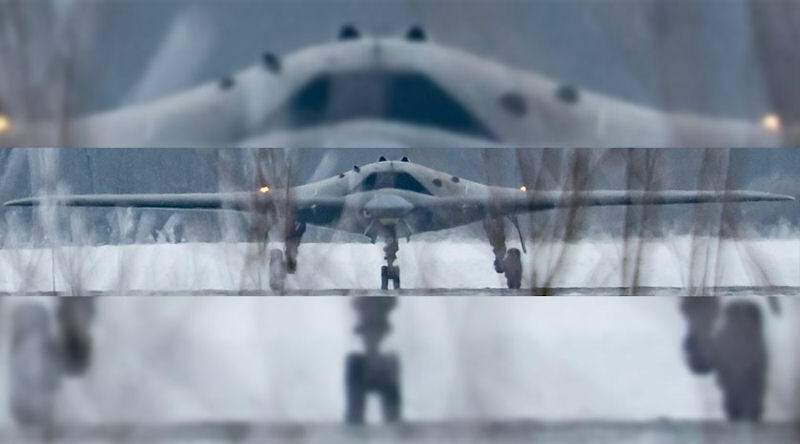 In 2017, on the Internet, a photograph of the "Hunter" was seen, cut out from the presentation of the Ministry of Defense of Russia, judging by which, the device is developed according to the "flying wing". The degree of readiness of the first sample of the device from a photograph cut from a presentation by the Russian Ministry of Defense is difficult to determine, since it is not clear whether the on-board equipment is already installed on the device. The purpose of the research is to create an unmanned reconnaissance and strike system that would have a high speed and autonomy. 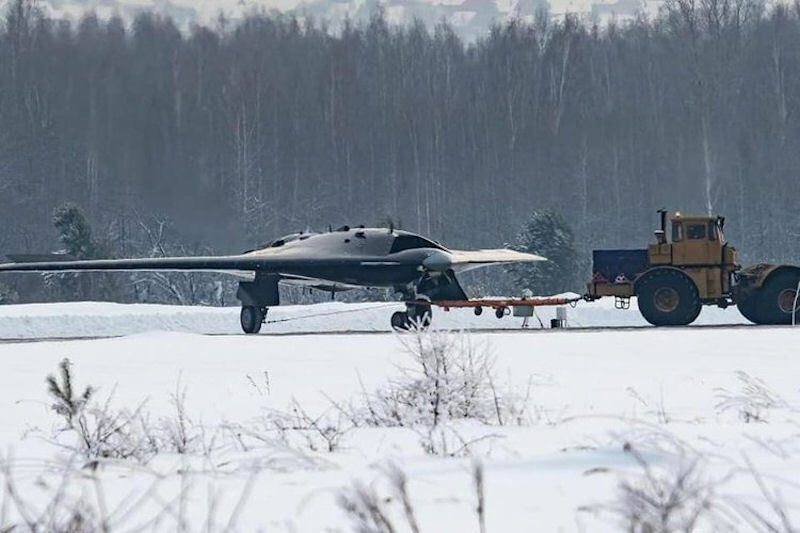 "Hunter" is characterized as "unmanned aerial sixth generation machine." 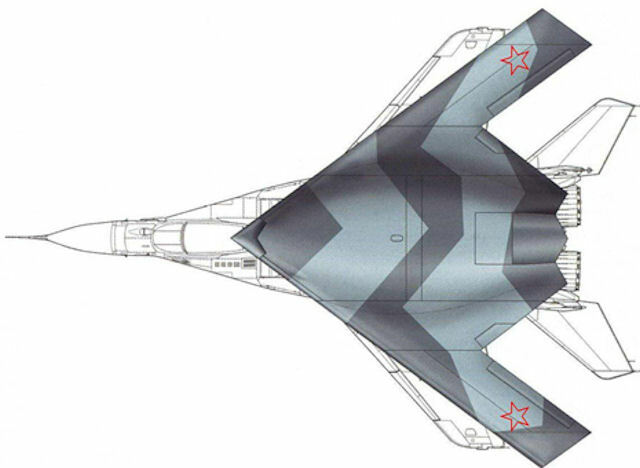 It is known only that in the "Hunter-B" it is planned to use the technologies of the prospective heavy fighter T-50 (PAK FA). The work on the research work "Hunter" is carried out by PJSC "Company Sukhoi" under the contract of the Russian Defense Ministry, issued on October 14, 2011. 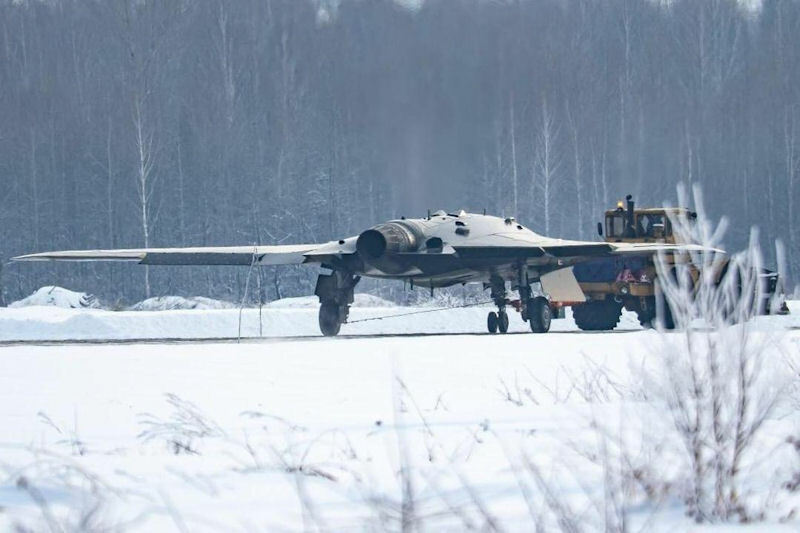 [other sources report "Officially, the development of the impactless drone under the project "Hunter-B" began in October 2012, when the work of the companies "Sukhoi" and "MiG" was ordered by the Russian Defense Ministry. "]It was reported that the demonstrator UAV S-70 was produced at the Novosibirsk aviation plant Chkalov - branch of PJSC Company Sukhoi. It is expected that flight tests of the new device will begin in 2018, and in 2020 it will go into service. 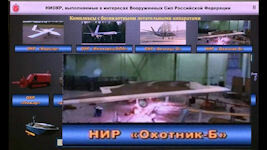 The mass of the UAV is in the range of 20 tons. 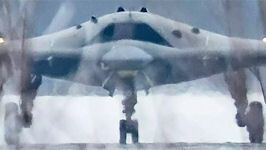 Based on the data on the take-off weight, it can be assumed that this drone will be close in its characteristics to the American drone X-47B development Northrop Grumman. It can fly at high subsonic speeds, operating within a radius of 4,000 kilometers, carrying a diverse target load, including a shock, with a mass of up to two tons. The Okhotnik has a top speed of 1000 km/h (almost the speed of sound). The drone is highly autonomous thanks to its AI brain. 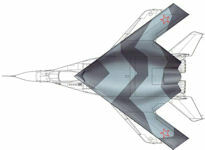 What’s more, some of its technology and ammunition have been borrowed from the Su-57 fifth-generation fighter. 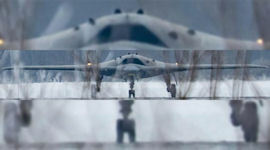 “The Okhotnik’s arsenal includes air-to-surface missiles and an array of bombs (glide and operator-controlled) that will not be suspended from the wings, but hidden inside the body to reduce visibility on enemy radar,” Professor Vadim Kozyulin of the Russian Academy of Military Sciences told Russia Beyond. They potentially include the OFZAB-500 high-fragmentation high-explosive incendiary bomb and the ODAB-500PMV fuel-air-explosive bomb, which were used during the campaign in Syria. “This is not just one of the first strike drones built in Russia, but a platform for testing sixth-generation fighter technologies. I wish to stress that the specifications are still being finalized, but the main feature is already known—fully robotized systems,” Kozyulin made clear. In Russian military terms, “fully robotized” means no pilot and the ability to make independent battle decisions from start to end. “The machine already performs the full cycle of combat operations, with the exception of deploying weapons in battle. This function lies with the operator,” he added.